A garden is a place of beauty, wonder, and magical creativity. We each have within us a magical garden full of creative ideas and fun. The problem for many of us is that we lose sight of our own wonder and creativity, we lose our own inner garden. The Lost Garden is a new creation from the magical place inside me that finally feels free to express all my creativity. The move to a new home has already inspired so many ideas for my crochet designs but also for the physical garden I have, which is in desperate need of some redesigning and some love and attention, but that has to wait until the spring. Also, very close to where I live is the beautiful Lost Gardens of Heligan, a beautiful garden that was lost for years, but now an amazing team of people have worked with nature, accepting, respecting and protecting it, to bring the gardens back to life. I think this is an amazing ethos for life, and for the design work I do, to work with the yarn and colours and allow it to be what it wants to become. I have always found that nothing in life ever works if we force it! Let me take you on a little walk around The Lost Garden, and show you lots of gorgeous photos. The central feature is a star, surrounded by flowers in a cupped circle, giving lots of texture right from the start. Next comes a ring of daisies, light and lacy, and very simple to make. The photo tutorial gives detailed instructions for the daisies. Our garden then bursts to life in an unusual ten pointed star, with rows of texture, flower buds and pretty blooms. This all sits within a circular mandala. The corners are each made separately, with layers of petals, gradually building out to a square. Then we need to contain our garden slightly with a beautiful trellis band. On top of that sits arches of flowers that remind me of rose arbours. Finally, we come to the border of beautifully framed daisies, with flat corners. I love the way Jane made her border daisies in two colours to look like pansies. Before I show you the amazing and glorious array of The Lost Garden’s made by my wonderful testing team, here is some information I know many of you have been waiting for. You can purchase the pattern from my Ravelry store, this will give you the choice of US and UK terms, and either a photo tutorial or a written pattern without photos. There are two yarn packs available in my Deramores store in the colours I used, however these packs come with US terms photo tutorial only. If you just want to buy the yarn this is what you will need to follow my colours or get creative and let your own inner garden come to life with your own colour choices. You can purchase any of the Stylecraft yarns from Deramores, Woolwarehouse or LoveCrochet. I used 4 colours for both of my blankets, the pattern tells you the colour numbers and they are listed at the beginning of each round. If you chose to go your own way with colour, and I know many of you will create some beautiful colour combinations. You will need approx. 4000 meters/4400 yards, allowing for colour changes. The minimum amount needed is 3900m/4300yds, Double Knitting yarn and 4mm hook. Finished size: 58 inches/147cm square approx. For Worsted/Aran weight yarn with a 5/5.5mm hook you will need approx 20% more yarn. Finnished size: 70 inches/178cm square approx. The Lost Garden yarn usage. If you are going with multiple colours you will find the round by round list of yarn usage helpful. Simply click the link above to download the pdf, this is for Double Knit yarn. Are you ready for this riot of gorgeous gardens? These were all made by my testers and I have given you links to their Ravelry project pages so that you can see the colours they used, and any little helpful hints they may give you. Ineke, not satisfied with making one blanket, Ineke made two! The first in beautiful calm shades of blue. Stylecraft Special Dk in Cream, Midnight, Aster, and Cloud Blue. Stylecraft Special Dk in Jaffa, Wisteria, Sunshine, Emperor, Empire, Bright Pink, and Bright Green. Mellissa’s colours are absolutely stunning, a hot, hot, hot tropical theme. 4 Seasons Marvel Soft 8ply in Charcoal, Fuschia, Pale Pink, and Cream. Jane also went crazy and made two. First we have the cool classical Twilight garden. Stylecraft Special Dk in White, Graphite, Emperor, and Silver. And we have a riot of stash buster colours. With all the different stitches and textures this design works perfectly as a stash buster, you can find a pdf download with a full list of amount of yarn used for each round with the yarn requirements above. Sherrie went large and used just three colours, although if you check out her Ravelry project notes you will see that one is a colour changing yarn in shades of grey. Finished size: 70 inches/178cm square. Sherrie used Hobby lobby I love This Yarn in White, Red Heather, and Anthracite. Norreen, also used Hobby Lobby I Love This Yarn in Antique Teal, Ivory, Sea Blue, and Rosy Cheeks. Becky created this gorgeous The Lost Garden in shades of pinks and greens, with Mocha as her neutral. Stylecraft Special Dk in Walnut, Cream, Bottle, Meadow, Raspberry, Pale Rose, and Mocha. 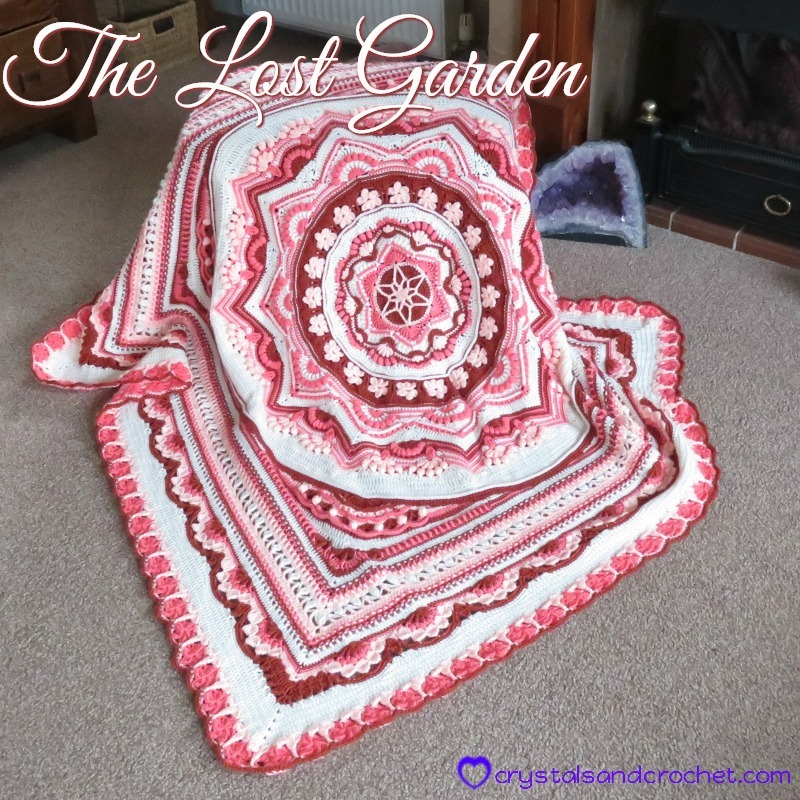 Lesley’s The Lost Garden is full of beautiful pastel shades, using a mix of Hobbycraft and Stylecraft yarns. I can’t wait to see all the amazing creations you have waiting to blossom. ♥ Please remember all of my patterns are covered by copyright law and may not be copied or shared in any way. You may share a link to my website or Ravelry store with anyone, you may print the PDF for your own use, but please do not alter, change or share in any way. Are you going to have a video tutorial? Hi Helen! Your patterns are gorgeous! I’ve made the Mandala Madness blanket and learned so much!! I can’t wait to get started on The Lost Garden. I plan on using Caron Simply Soft. What is the best way to increase the size of the over all blanket, if needed? Bonsoir, Avez vous prévu une traduction en français ? Quick question about The Lost Garden. Is there a coloring sheet for this pattern that’s been released? I have my colors picked out but need to decide on placement. Thanks! i would like to make The Lost Garden in the purplish colors but using Stylecraft DK. I will appreciate if you an make me a recommendation. All beautiful versions of your Beautiful design. You have to love them all! In 2006, We visited the Gardens of Helegen ( from Australia). We also visited the Eden Project. I have always been a domestic crafter: sewing, crochet, knitting, gardening, creating soft furnishings etc. but am too cripple with Inflammatory arthritises now to do more than admire the work of others. We stayed in a lovely BB close by. The gardens were lovely. In particular I remember the huge rhododendrons. A Japanese garden and the gully walk. Thank you for developing this beautiful blanket. I want to buy your pattern, but don’t want to use PayPal. Hi Helen. Thanks soooo much for this awesome pattern. Quick question.. how much of C4 do we need I can’t seem to find it here. I haven’t bought the patten yet (waiting to get home from work first☺️) so I don’t know if it says how many on there. Thanks once again.